Let’s start with a disclaimer: I am not the biggest beer fan alive. For this, I am partially blaming my life in the Netherlands and the beer overdose that took place over there. But, when I find a different, nice, local beer…oh yes, I will enjoy it with all my heart. That’s the case with Noctua. Noctua is a new Athenian microbrewery which war founded in 2016 by 4 friends. Despite being new in the market, Noctua has managed to win not only our hearts, but also 3 medals at the International Beer Challenge 2017 in London. So, we are talking serious business here. Noctua is now producing 2 types of beers: a black IPA and a Pale Ale. From time to time they are also producing special brews. 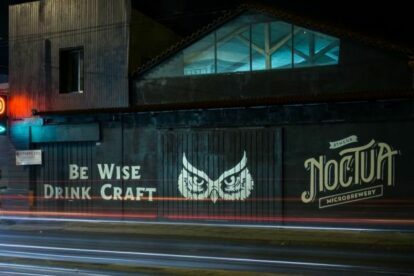 Noctua’s microbrewery is located down town, right next to Gas Factory – that’s as Athenian as it gets I believe. You can visit the place and enjoy the beers when an event takes place, which is more or less once per month. The plan is to increase their opening hours, but until then you can check their Facebook page for the upcoming events. If you see one, don’t miss it! Until then, you can keep an eye on different Athenian bars that serve Noctua around the city such as Barrett, Spirtokouto or restaurants such as Seychelles and Rakor! Look out for the Owl!